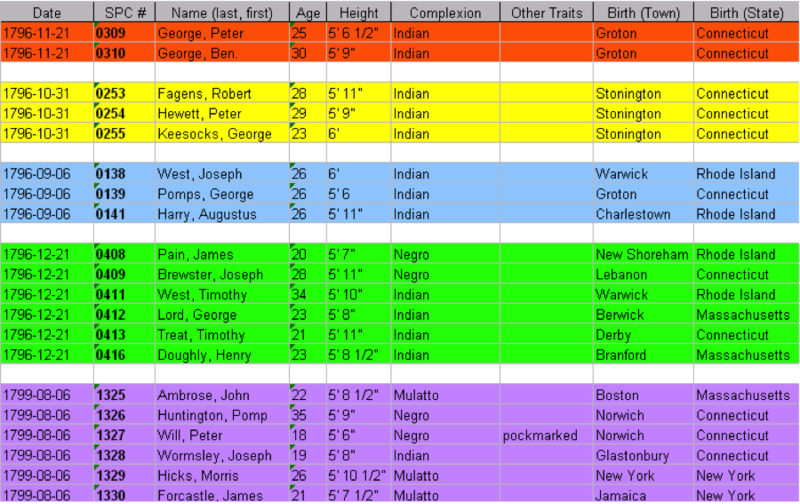 A number of years ago I came across a footnote in a book that referenced two Indian men, Peter George and Benjamin George, in the Records of the Collector of Customs in the Customs District of New London, Connecticut. I knew these men from other documents as brothers and as “Cheifs and Councellors” of the Pequot Tribe. Their presence in New London and in this “new” record group caught me off guard. Curiously, they had been issued Seamen’s Protection Certificates in 1796 (serving as a type of “passport” for mariners) – numbers 309 and 310, respectively. I wondered about this and took a trip to Mystic Seaport’s Blunt-White Library where I viewed the original documents on microfilm. I was struck by the number of mariners of color in these documents and by the alphabetically organized “registers of seamen” in which they appeared. While viewing Peter and Ben’s entries in the “G” register, I wondered, “who was issued Certificate numbers 308 and 311”? At the time I asked that question, I could not fathom the histories I was about to uncover. 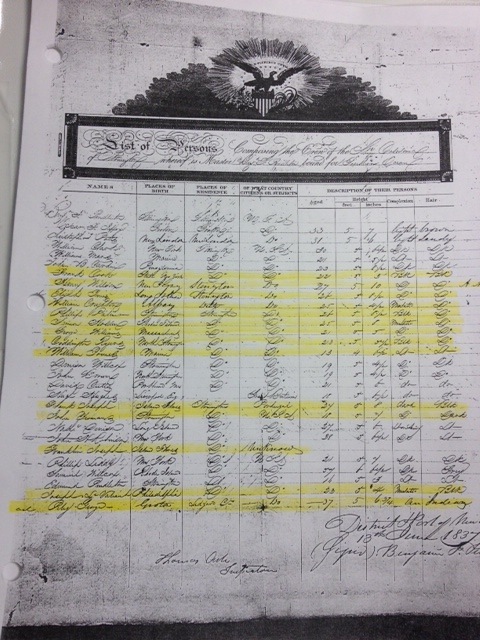 Other types of customs records were important as well, including Surrendered Crew Lists. These records show the incoming and outgoing crews of merchant and, later, whaling vessels. They also demonstrate that, with certificate in hand, Indian men joined others as they went to sea and plied the waters of the world. My team and I added this new crew list material to our database bringing the total entries for men of color to nearly 17,000 (individuals often appear many times). The crew lists, however, only noted the intended destination of the voyage and not any deviations or other experiences. I knew this could be refined, but it would require a different kind of touch. In Summer 2008, I presented my work at the World Whaling Heritage Symposium, hosted by Mystic Seaport and New Bedford Whaling Museum. Afterwards, Dr. Tim Smith of NOAA’s National Marine Fisheries Service based at Woods Hole Oceanographic Institute, to me about his work on the historic whalefishery. His Cachalot Project was oriented around understanding historic whale populations, ecology, and migration patterns. Drawing from the 15,000 known whaling voyages that took place in the 18th and 19th centuries, Smith and his team located and about 1500 voyage logbooks in the archives of Mystic Seaport and the New Bedford Whaling Museum. 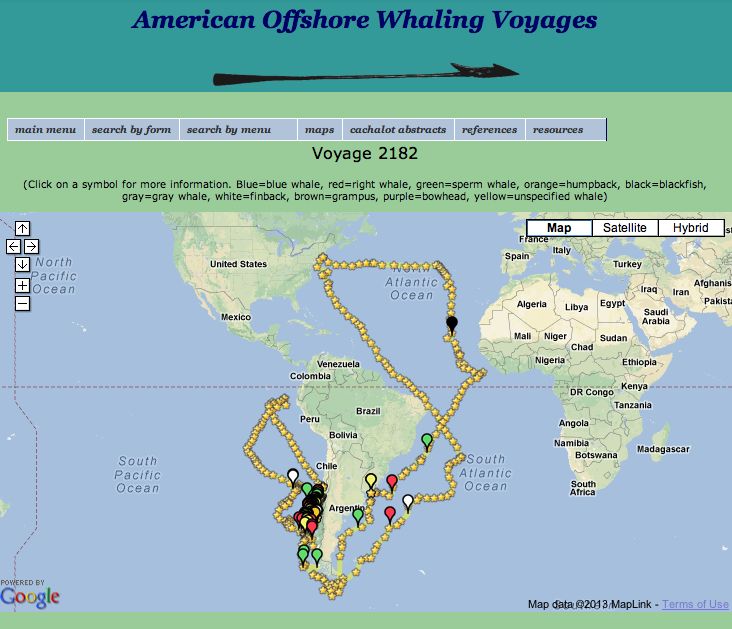 Using daily recorded latitude and longitude and log notations on whales killed, they mapped each “voyage track” that would be accessible online through American Offshore Whaling Voyages. Immediately, it became clear that this was just the data set I needed if I could only cross reference the voyage logs with vessels crewed with groups of Indian men! Unfortunately, because most of the voyage tracks mapped were from New Bedford-based whaleships, only three of them intersected with the Indian mariners in my New London-based database. Conceptually, though, this was an excellent start. The Indian Mariners Project was born! This entry was posted in Uncategorized and tagged American Indian, Aquinnah, communities of color, Eastern Pequot, Indian, Indian Mariners Project, Jason Mancini, Katie Raia, Lantern Hill Pequot, Mashantucket Pequot, Mashantucket Pequot Museum and Research Center, Mashpee, Mohegan, Montauk, Mystic, Mystic Seaport, Narragansett, Native American, Nehantic, New Bedford Massachusetts, New Bedford Whaling Museum, New London Connecticut, Niantic, Nipmuc, people of color, Pequot, Pequot Museum, Shinnecock, Stonington, Wampanoag, whaling, Woods Hole Oceanographic Institution. Bookmark the permalink.